George Orlo Poinar was born in 1936 in Spokane, Washington. When he was three year old, the family moved to Ohio where his father worked as a musician and a Bach scholar at Baldwin Wallace College. George practiced the piano and violin from an early age, but over time his interests moved in the direction of natural history instead. He grew particularly fond of bird watching during high school. Poinar's waning interest in music engendered family tensions, and as a result, during his high school years, he spent two summers in Iowa working on a farm. Poinar's farm experiences prepared him well for his undergraduate experience at Cornell University's Agricultural School, where he initially studied ornithology. After his first year, Poinar was encouraged by a professor of ornithology to explore other fields that promised stronger job opportunities. As such, Poinar ventured into botany and landed a summer job studying the effects of insects on various species of plants. His research on insect hosts led to a graduate assistantship in Cornell's Entomology Department where he researched a parasite of the alfalfa weevil that was impacting pastures in the Hudson Valley. Poinar received his Ph.D. from Cornell in biology in 1962. Seeking further knowledge and experience in nematology, Poinar traveled to England and studied with some of the leading experts in the field at the Rothamsted Experimental Station. He likewise visited researchers in Paris, Wageningen, and St. Petersburg during this time. Importantly, while on this trip, Poinar also collected his first piece of amber from a small cape town in Denmark. In 1964 Poinar accepted a position in the University of California-Berkeley Department of Entomology, where he began studying insects affecting nutgrass. Over the next few years, Poinar's research focus shifted from the insects affecting humans to the parasites and pathogens affecting insects. During his early years at Berkeley, Poinar also headed the school's Insect Disease Diagnostic Service, helping to identify pathogens affecting medically and agriculturally important insects. After a lack of funding led to the closure of the Diagnostic Service, Poinar was invited to travel overseas and study the impact of nematodes on the fertility of rhinoceros beetles, which harmed coconuts and were considered a pest insect. As he studied this problem, Poinar traveled around the tropics, visiting Western Samoa, New Caledonia, Northern Australia, Thailand, Malaysia, and Borneo. During the trip, which was funded by the World Health, Food and Drug Organization, Poinar also kept an eye out for cowry trees, a species whose resin turns to amber over time, and amidst his explorations he began to accumulate a growing collection of dried resin samples. In 1969 Poinar traveled to Leningrad where he was engaged with work at the Soviet Academy of Sciences. While in the USSR, he also examined collections of Baltic amber that were held at local museums. Later, Poinar was invited to travel through Africa to investigate nematode parasites in medically important insects. His research was again funded by the World Health Organization, and was focused on black flies, tsetse flies, and mosquitoes. 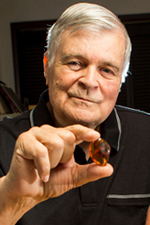 After concluding his work in Africa, Poinar began his first amber studies at UC Berkeley. Initially he viewed the work as a side project and a good opportunity to collaborate with his wife, Roberta, an electron microscopist at Berkeley. The couple made their first breakthrough when, in examining a piece of Baltic amber, they discovered an ancient fly that retained recognizable cells and nuclei in its abdomen. Thus began the Poinars' period of intense focus on studies of extinct DNA. 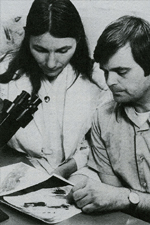 In 1975 Poinar was asked by colleagues at Berkeley to identify nematodes encased in Mexican amber. Poinar took an immediate interest and ultimately chose to study and describe the nematodes further, eventually traveling to Chiapas to collect his own Mexican amber specimens. Indeed, over the years, Poinar has traveled around the world to collect amber, visiting Poland, Morocco, and the Dominican Republic among other locations. Poinar has authored several books documenting his work in paleoentomology. In 1994 he published A Quest for Amber, which was followed in 1999 by The Amber Forest: A Reconstruction of a Vanished World, co-authored with his wife. He published Lebanese Amber: The Oldest Insect Ecosystem in Fossilized Resin in 2001, and co-authored another book with Roberta in 2008, titled What Bugged the Dinosaurs? : Insects, Disease and Death in the Cretaceous. Poinar's later three books were published after he retired from Berkeley and moved to Corvallis in 1995. He received a courtesy appointment at Oregon State University in the Department of Entomology when he arrived in Oregon and, in the years since, has collaborated productively with a number of OSU scientists. Poinar's research has led to several fascinating discoveries, including now-extinct flowers dating to the Cretaceous period, a 100-million year old spider that was fossilized while in the act of attacking its prey, and segments of an ancient gecko. His work is also notable for having popularized the idea of extracting DNA from insects found in amber, a notion that led author Michael Crichton to visit Poinar while writing his best-selling novel, Jurassic Park. (Universal Studios later approached Poinar to act as a consultant during the production of the movie version of Jurassic Park.) Poinar has also proposed a novel theory regarding the extinction of the dinosaurs that is based upon his discovery of deadly parasites found in insects that date to the dinosaurs' period in natural history. Today, Poinar continues to make headlines as he explores ancient insects and their parasites as preserved in amber. He also researches in OSU's arthropod collection and studies insects native to the Oregon dunes.